Bridgend and District NHS Trust, Bridgend, South Wales, CF31 1JP. Edition: 2.1 (Added new resource). Lasers have been used in dermatology for more than 20 years. The first lasers used were the Ruby and Argon lasers, and a great deal of experience has been obtained particularly with the latter. The Argon laser has been used predominantly in the treatment of cutaneous vascular lesions and the CO2 laser both as a cutting and ablating tool. There have been significant advances in the development and use of dermatological lasers. Much of this development stems from the close co-operation of scientists and clinicians and laser manufacturers. Today's lasers are more specifically designed for a narrow range of applications and have significant advantages over older lasers. This article will review the use of the flashlamp-pulsed tunable dye laser in the treatment of port wine stains, and developments in the treatment of tattoos and cutaneous pigmented disorders, and skin resurfacing. Flashlamp-pumped pulsed tunable dye laser treatment. For over 20 years, the Argon laser has been the most widely used laser for the treatment of cutaneous vascular lesions . The Argon laser emits blue and green light at 488 and 514 nm. These wavelengths of light are preferentially absorbed by oxyhaemoglobin and melanin in the skin. The light energy absorbed by erythrocytes within blood vessels is converted to heat, leading to red cell destruction and thrombosis of small blood vessels. Histological assessments of Argon laser treated PWS have demonstrated that although the light is selectively absorbed by haemoglobin, the damage induced is relatively non-specific[7,8]. These changes are in part due to non-selective absorption of the Argon laser light by other chromophores such as melanin, and diffusion of thermal energy away from targeted blood vessels to adjacent structures due to the long [ms] laser pulses employed. Analysis of the optical properties of PWS skin has suggested different parameters to those of the Argon laser for successful treatment of these naevi[10,11]. Light with a wavelength of 577 nm coincides with the beta absorption peak of oxyhaemoglobin and was the original wavelength used in flashlamp-pumped pulsed dye lasers. Preliminary studies revealed high response rates with minimal complications. Penetration depth can be increased from 0.5 to 1.2 mm in PWS skin, whilst maintaining the same degree of vascular selectivity, by increasing the wavelength of light from 577 to 585 nm . It is possible to confine thermal injury to targeted blood vessels, without heat diffusion to surrounding tissues, by using microsecond pulses [Table 1]. Table 1: Treatment parameters of flashlamp-pumped pulsed dye laser. Histological studies have confirmed the selective vascular injury induced by this laser with minimal damage to the overlying epidermis. Videomicroscopic analysis of treated skin has confirmed that there is no thermal damage to the epidermis. The significant advantage of this laser is its safety and efficacy in children with PWS and low incidence of scarring[15-17]. Treatment in older children and adults is well tolerated, local anaesthesia (EMLA cream) often being adequate. Younger children may require repeated general anaesthetics. The laser produces marked bruising which can persist for up to 2 weeks, although crusting and weeping is much less common than with other lasers. Treatments to the whole port wine stain are generally repeated every 6 - 12 weeks and a course of treatment is prolonged, 10 or more treatments often being necessary. Not all patients will clear; the site of the PWS will influence outcome. Recent work analysing the pattern of vascular ectasia within a PWS using a videomicroscope has identified patterns of ectasia associated with good and poor outcomes from pulsed dye laser therapy. Patients with ectasia of the superficial capillary loops had a better outcome than those with ectasia of the horizontal vascular plexus. Further work may enable a more accurate prognosis for outcome of treatment. Best results have been on facial PWS and worst results on the lower limbs. [Fig 2a & b]. Hyperpigmentation may be a problem, particularly following treatment of PWS on the leg. Scarring is rare without additional trauma in the post-treatment period. This laser is also reported to be of value in hastening the resolution of strawberry haemangiomas[23,24], particularly if the strawberry haemangioma is causing complications such as ulceration or bleeding, but controlled studies are lacking. Treatment should be performed early for any benefit. However the flashlamp-pumped dye laser can also produce satisfactory changes in residual haemangiomas with a prominent telangiectatic component. Tattoos often applied in teenage years may become a source of regret and a social burden in later life. A number of methods of removal of tattoos have been employed including dermabrasion, salabrasion, cryotherapy and excision. Surgical excision of large tattoos requires skin grafting. The other methods suffer from the disadvantages of incomplete pigment removal, necessity of repeated procedures, pain and frequent scarring. 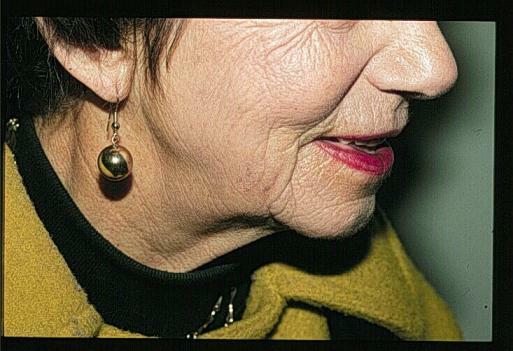 Carbon dioxide laser therapy removes tattoo pigment after vaporization of the epidermis and superficial dermis. Although effective, this laser has a high incidence of scarring and pigmentary disturbances. "Q-switching" whereby high energy levels [5 - 10 J/cm2] delivered in ultrashort pulse widths [10 - 80 ns] of Ruby, Nd:YAG and Alexandrite lasers has offered significant advances in the treatment of tattoos, particularly blue-black amateur tattoos[28-30] [Fig 3a & b]. Fig. 3a & b. 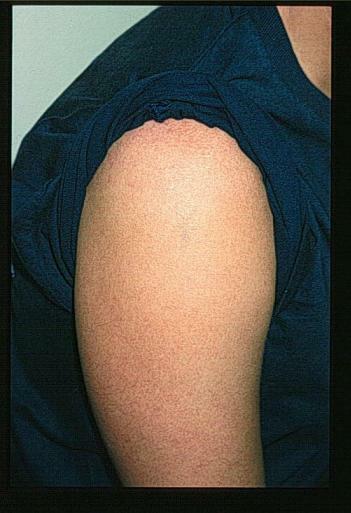 Amateur tattoo on shoulder treated once with the Q-Switched Nd:YAG laser. 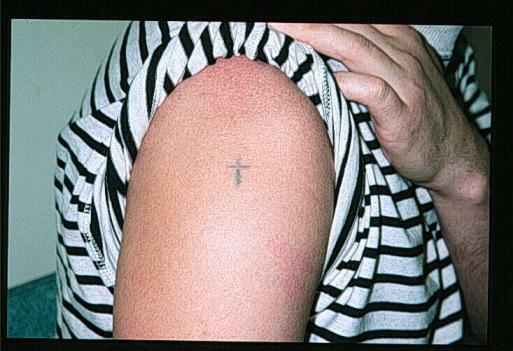 The light emitted by these lasers interacts with dermal pigment within tattoos and produce selective removal of the pigment, partly by photomechanical disruption of the pigment granules. Ruby lasers emit light at 694 nm and Nd:YAG lasers at 1064 nm. Both lasers produce best results in blue-black tattoo pigments. The Ruby laser can also be used to treat green tattoos. Frequency doubling of Nd:YAG laser light halves the wavelength to 532 nm producing green light. This green light can produce fading of red tattoo pigments. The Alexandrite laser with a wavelength of 755 nm produces slower results than the other two Q-Switched lasers but may be of value in the treatment of other coloured tattoo pigments. These lasers produce much less epidermal reaction than other methods of tattoo removal particularly if large laser beam diameters are used. There is a consequent reduction in the incidence of scarring following treatment. 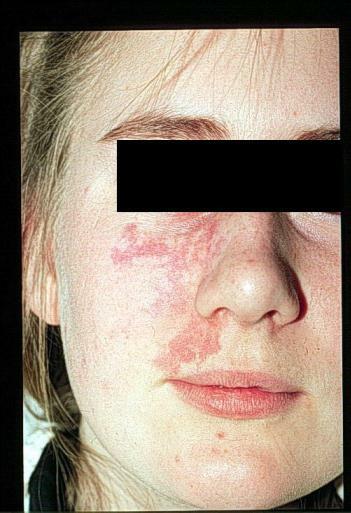 Hypopigmentation following Ruby laser treatment may be a problem. As melanin absorbs across a wide part of the electromagnetic spectrum, older lasers with long pulse durations have been employed with some success in the treatment of pigmented cutaneous lesions. Non-specific thermal damage following heat diffusion to other cutaneous structures resulted in scarring in some cases. Q-Switched lasers have been used to treat cutaneous pigmented lesions with some success[36-39]. Both epidermal and dermal pigmented lesions may respond, such as cafe au lait macules, lentigines and naevus of Ota [Fig 4a & b]. Fig. 4a & b. Benign lentigo treated twice with the Nd:YAG laser. Repeated treatments may be necessary and the lesion may recur. There is insufficent data concerning laser treatment of benign melanocytic naevi to recommend this form of treatment[40,41]. It is not possible currently to determine which laser is more successful in this field as few authors have presented data on large series of patients. However, preliminary work from Japan on 200 naevus of Ota patients treated with the Nd:YAG laser has revealed impressive results in some patients. Q-Switched lasers have a low incidence of adverse reactions in this group of conditions. The Alexandrite laser theoretically may also be of value in the treatment of pigmented lesions although there is little published clinical work to support this as yet. A flashlamp-pumped pulsed dye laser emitting light at 510 nm has also been used in the treatment of pigmented lesions[42,43]. Again short pulse durations [300 ns] and high peak powers [approximately 4 MW] are utilised to produce selective photothermolysis of pigment-containing cells. The carbon dioxide laser emits infrared light at 10,600 nm. This wavelength is absorbed by tissue water and the laser produces non-selective thermal damage of tissue. This laser is used widely in gynaecological surgery and has been used to treat a number of dermatological disorders. The laser can be used in focused mode with a small spot size and high energy densities to cut tissue haemostatically as small blood vessels are sealed thermally. In the defocused mode, with a spot size of 2 mm, the laser can be used for superficial vapourisation under local anaesthesia. A variety of skin diseases have been treated with this laser[45-48]. 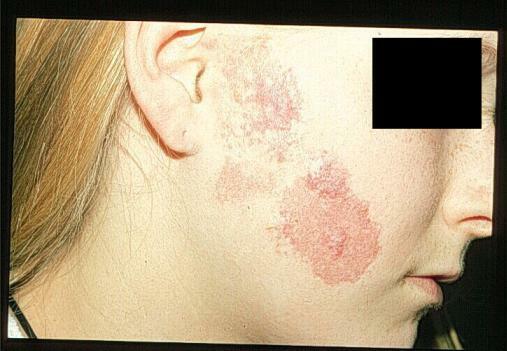 This laser has a relatively high incidence of scarring and other hazards include human papilloma virus DNA present in the smoke plume generated when treating warts [Fig 5]. A resurgence of interest has developed in the CO2 laser by the use of ultrapulses of the light. Pulse durations of 250 µs are delivered which allows thermal destruction of the epidermis and superficial dermis without thermal diffusion to deeper tissue. The laser can be linked to an optomechanical scanner for improved results. The laser has an increasing role in the treatment of photodamaged skin and rhytides. Both ablation of tissue and dermal shrinkage are considered important mechanisms in the improvement of photodamaged skin. The latter has been measured objectively. Careful pre and post operative preparations are necessary to reduce the risk of adverse reactions which include scarring, post inflammatory pigmentary disturbances, persisting erythema, bacterial and viral infections. The newer generation of lasers with short pulse durations and high peak powers are capable of more selective destruction of target chromophores. More appropriate wavelength selection for different cutaneous disorders has resulted in a modest improvement in results of treatment and a substantial reduction in adverse reactions such as scarring and pigmentary disturbances. The flashlamp-pulsed dye laser has enabled the safe treatment of young children with PWS, and Q-Switched lasers have been effective in the treatment of a number of cutaneous pigmented disorders, in particular blue-black tattoos. Further research will clarify which, if any, is the "best" laser in this second group; significant advances in technology and clinical results offer an optimistic future in this field. The author acknowledges the support of the Disfigurement Guidance Centre, Cupar, Fife, Scotland. Carruth, J. A. The argon laser in the treatment of vascular naevi. Br J Dermatol 1982; 107: 365 - 368. Motley, R. J., Katugampola, G, Lanigan, S. W. Microvascular abnormalities in port wine stains and response to 585 nm pulsed dye laser treatment. Br J Dermatol 1996; 135: Suppl 47: 13 - 14. Lanigan, S. W., Cotterill, J. A. Use of a lignocaine-prilocaine cream as an analgesic in dye laser treatment of port wine stains. Lasers Med Science 1987; 2: 87 - 89. Motley, R. J., Katugampola, G., Lanigan, S. W., Videomicroscopy of vascular patterns in port wine stains predicts outcome. Lasers Surg Med 1996; Suppl 8: 94 - 99. 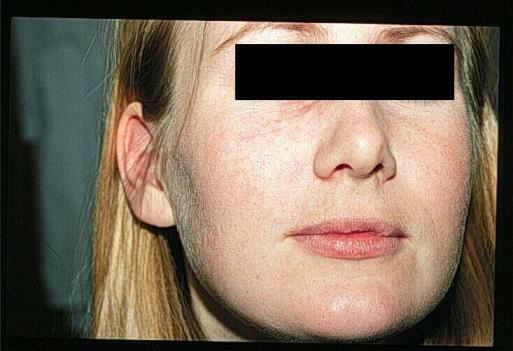 Swinehart, J.M., Hypertrophic scarring resulting from flashlamp-pumped pulsed dye laser surgery. J Am Acad Dermatol 1991; 25: 845 - 46. Varma, S., Lanigan, S. W. The psychological, social and financial burden of tattoos. Br J Dermatol 1996; 135: Suppl 47: 37. Lowe, N. J. Laser therapy of vascular benign pigmented lesions and tattoos. In: Marks, R., Cunliffe, W. J. [eds], Skin Therapy. London: Martin Dunitz, 1994. Kilmer, S. L., Lee, M., Farinelli, W. et al. Q-Switched Nd:YAG laser [1064 nm] effectively treats Q-Switched ruby laser resistant tattoos. Lasers Surg Med 1992; Suppl. 4: 72. Fitzpatrick, R. E. Comparison of the Q-Switched ruby, Nd:YAG and alexandrite lasers in tattoo removal. Lasers Surg Med 1994; Suppl 6: 52. Geronemus, R. G., Ashinoff, R. Use of the Q-Switched ruby laser to treat tattoos and benign pigmented lesions of the skin. Lasers Surg Med 1991; Suppl. 3, 64 - 5. Ashinoff, R., Levine, V., Tse, Y., McClain, S. Removal of pigmented lesions: comparison of the Q-Switched ruby and neodynium: YAG lasers. Lasers Surg Med 1994; Suppl. 6: 50. Kasai, K-I., Notodihardjo, H. W. Analysis of 200 nevus Ota patients who underwent Q-Switched Nd:YAG laser treatment. Lasers Surg Med 1994; Suppl. 6: 50. Goldberg, D. J., Stampien, T. Q-switched ruby laser treatment of congenital naevi. Arch Dermatol 1995; 131: 621 - 623. Ruiz-Esparza, J., Fitzpatrick, R. E., Goldman, M. P. Selective melanothermolysis: a histological study of the Candela 510 nm pulsed dye laser for pigmented lesions. Lasers Surg Med 1992; Suppl. 4: 73. Fitzpatrick, R. E., Goldman, M. P., Ruiz-Esparza, J. Treatment of benign cutaneous pigmented lesions with the Candela 510 nm pulsed laser. Lasers Surg Med 1992; Suppl. 4: 73. 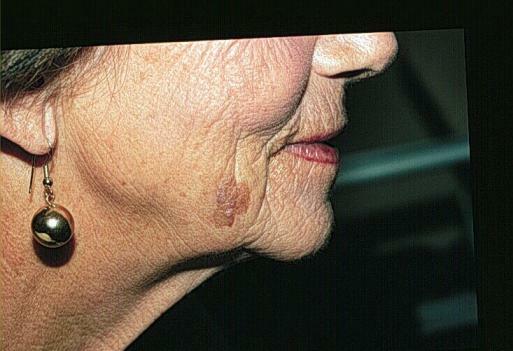 Reid, R. Physical and surgical principles governing carbon dioxide laser surgery on the skin. Dermatol Clin 1991; 9: 297 - 316. Hruza, G. J. and Dover, J. S. Laser skin resurfacing. Arch Dermatol 1996; 32: 451 - 458. American Society for Dermatologic Surgery web page on laser surgery. The Lund Medical Laser Centre at Lund University . American Academy of Dermatology - Vascular Birthmarks - Patient information pamphlet. Alta Vista search on port wine stains, lasers and dermatology.